Well, around 30-odd years ago, when dinosaurs roamed the earth, I began GMing a role-playing game called RuneQuest, a skills-based fantasy system, without levels or classes. I enjoyed the mechanics of the game, especially the fact that all player characters could use magic to augment combat or heal wounds. But what really got me hooked was Glorantha, the world in which the adventures took place. Glorantha wasn't your usual medieval fantasy world; it was defiantly Bronze Age in its inspiration, with iron a rare and magical material. This world spoke to my need for something out of the ordinary, something other than the castles, dungeons and wizards of mainstream fantasy RPGs. Glorantha wasn't even a planet in the conventional sense, but a cube of earth floating in a cosmic ocean, topped by the dome of the sky. Glorantha spawned many extremely high-quality supplements which have become legendary in role-playing circles for the breadth of their detail and the standard of artwork, especially those released during the 'RuneQuest Renaissance' of the early 1990's. 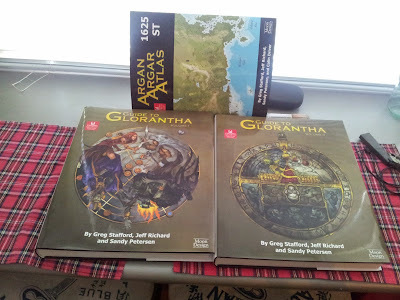 The rich mythology of Glorantha has been described elsewhere by better writers than I, and the world has been given a new lease of life (after a long hiatus) with the release of the encyclopedic Guide to Glorantha, a massive tome detailing almost every aspect of the world. It's heavy reading. I mean over 5 kg heavy. And of course, I simply had to get the Atlas as well - no buyer's remorse here! My nostalgic return to the RPG universe of my youth has led me down some odd pathways, not the least of which is a desire to come up with some figures to populate any hypothetical games down the track, but why stop with role-playing? Seasoned followers of this blog will know of Simon Miller and his excellent new Ancients rules system, To The Strongest! Well, after having seen Simon's ruleset in action with a tabletop version of a battle in Glorantha, my blolleague Mr Mills (another old Glorantha hand) and I began wondering how we might be able to assemble a couple of armies of our own. Well, everybody has to start somewhere, and suitably inspired by the efforts of far superior painters, I decided to paint up the handsome chap below; he's still a work in progress, but seems to be coming along quite nicely. He's a Warlord Games plastic Greek Hoplite, painted up as a Centurion of a Lunar Regiment, and a member of the Seven Mothers cult. 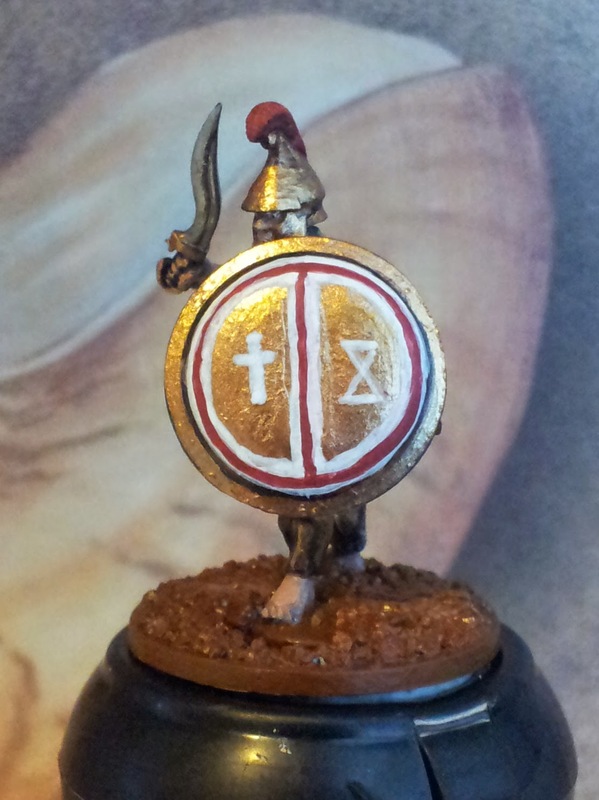 He bears the Runes of Death and Life inside the large Moon Rune on his shield (slightly wonky freehand work, but I'll see if I can't get that tidied up a bit). His iron kopis is an indication of the esteem in which he is held by his superiors. 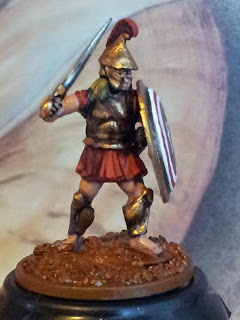 Needs a bit more work, of course, especially on the base, and he's based more for skirmish games or role-playing than being ranked up as part of a bigger unit on the field of battle, but I would like to try out a few more figs for Glorantha. This is my first 'ancient' subject in quite a while, and it's good to get in some practice again. Hi Ev, looks great! I have been making a modest start on the fantasy version of the rules. This week I'm going to order a load of bases for my Gloranthan stuff, I have something a little special in mind... my mate and I are going to rebase everything to a consistent standard. I'll send you some details anon. Early days yet, Simon, but thanks for the kind words! I'll be interested in the progress of your fantasy version of TtS! (how do we classify the Lunar Crater Makers? And will Ol' Batty make an appearance? ), and the ongoing upgrades to your Gloranthan armies. And we still need to find a manufacturer for Sables! Yes there will definitely be a space for the likes of the Crater Makers and Batty. I've always found Glorantha and (and Tekumel) as interesting settings, and as the setting usually drives the game in terms of plot and content, the more interesting the better! That's a nice piece of work Evan - presumably the human elements are easy to come by, but what about Gloranthan-specific monsters etc - will these be playing a part? Thanks, PW! I've been looking around a bit, and asking in Gloranthan circles for recommendations, and I have found manufacturers for some of the non-human races, or at least for suitable proxies. Fenris Miniatures has a Jack O'Bear and a Walktapus, even a couple of Ducks, but they don't come cheap! In any event, most of the army-level action is between human armies with some non-human or magical units as add-ons. I played RQ a few times and enjoyed it more than D&D - the skills, combat and magic systems seemed so much more natural. The RQ system was a real breath of fresh air, but Glorantha was what reeled me in. And now it has more fans than ever! Thanks Curt, I'll definitely have to start hunting down some lead and plastic to fit the bill. Some very promising leads so far! Sadly it looks as if the KS didn't take off & the range may be OOP for a couple of years judging by his FB comments. I absolutely love that MadKnight Sable! I wonder if we could get him to spin that mould a few times? I'll drop him a line. Thanks Neil, that's exactly what any tabletop Lunar Army needs! Some of the other stuff looks nice. I have some of the Lunar heroes & they dwarf Lance & Laser figs....I'm going to use them as Full Moon Corps paired 2 to a base. Hi Neil, I have some L&L- really big, then! I've seen some at shows but never next to anything for comparison. Reading Facebook, it does unfortunately sound like he has called time on the project. Great looking Hoplite, Evan. Nice freehand work on the shield, and love that kopis! Thanks Dean, painting this chap has been an education - hope I can get into the swing of things and increase the output! But all the encouragement from fellow bloggers and Gloranthaphiles is extremely heartening! Splendid work Ev, most definitely heading in the right diction. Thank you, Mr Awdry, looks like it's time to ask the advice of Michael 'Stakhanovite Painting Machine' Mills, I think! Thanks Karl, here's hoping I can build up some momentum! Great looking figure and I look forward to reading here how things develop. Just dipping my toes into Glorantha so far (bought some Mad Knight beastmen and have some bronze age chaps I intend to adapt...) but am a little overwhelmed by a mythos I can't quite fanthom yet. Thanks Alan - and welcome aboard!